We have never been really big with making desserts, my husband and I realized a few months ago when thinking of the menu, as we had invited people over for some big lunch or dinner. Not, that we don't like eating them. Or sweet stuff in general. If you'd see our chocolate drawer, you'd know. As we do not have dinner guests very often, my "problem" with desserts is that it's often too much for just two people. Just think of all the big cakes. I don't like cooking when no-one eats it. When we have guests, we also tend to go overboard with the starters and the main course, so people are already stuffed and do not want a dessert anymore. Anyway, I tried a few desserts recipes in the last few weeks. The blueberry cheesecake pots has become one of my favorites overnight, as they are easily portioned and require very little preparation time and cooking. The blueberries can easily be exchanged with other berries or a berry mixture. Cook the blueberries with the 2 tablespoons of agave syrup for a few minutes in a pan. Let cool. Mix the melted butter into the biscuit crumbs and press into 4 glasses or pots. Combine cream cheese with2 tablespoons of agave syrup and lemon juice. 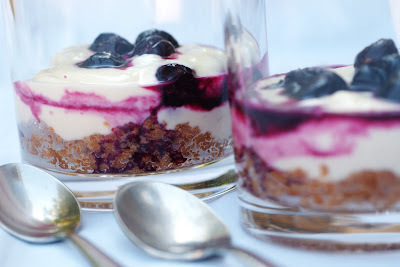 Make alternative layers of the cream cheese mixture and the blueberries. NOTE: I personally think that this dessert is best when it's served ice cold. Keep the cooked blueberries and the cream cheese mixture in the fridge for ar least 20 minutes. Prepare the layers only just before serving, as they tend to mix if you leave them standing for too long.